The U-shaped stand of the Wilovert series is built from one single cast part as an optimal prerequisite for high stability. 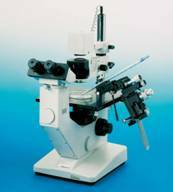 Micromanipulators can be adapted to the Wilovert microscopes with ease. For transmitted-light brightfield applications, the Wilovert carries a 12 V/30 W halogen lamp. For incident-light fluorescence investigations, an HBO 100 W mercury high-pressure lamp can be adapted. microscopes require dedicated objectives. The Helmut Hund GmbH offers objective/condenser combinations with long free working distances.